And so the time has come...I never thought I'd come to a point that I'll consider it. I don't want to brag or something, but I know I am quite good at it. People told me that I am, as well. But I guess, people just get tired of things they have to do most especially if it's becoming a routine. So don't do it, you might say. And what? Look weird? If I don't do it, then I'd be laughed at...or stared at. I remember an ex-officemate of mine who I think got the shock of her life when she saw me one early morning. Okay, I might be exaggerating here, but she was really like "WTF, is that you? What happened!?" Me: Well, it's way too early so I haven't had the chance to draw my brows yet. Yes, I am talking about my brows! I'm sure by now you'd agree that I really l look different without my drawn brows. And I am so sure you'd rather see me with them than without. 'fess up, I know you do! Hahahah. Anyway, I am thinking of getting them semi-permanently drawn, or embroidered...or perhaps to put it simply, tattooed. But I don't like the usual tattoo that turns green over time. I want to look it as natural as possible. 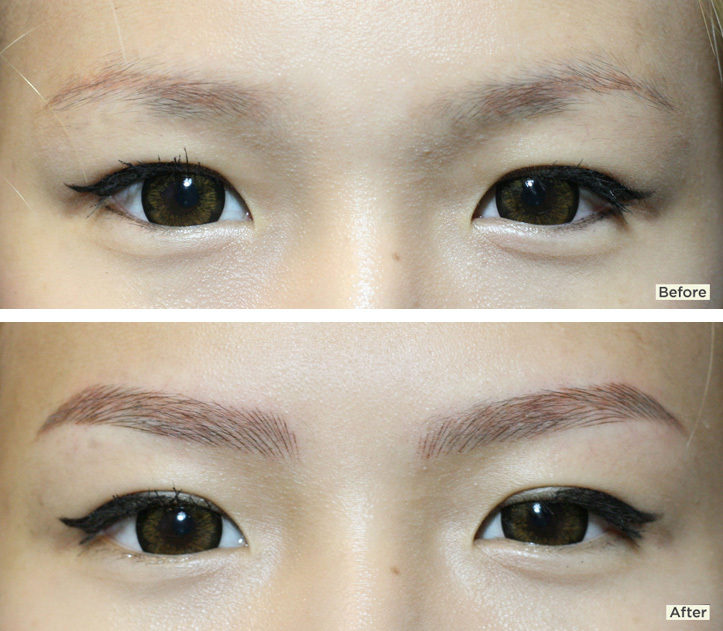 I've been reading about Browhaus' Brow Resurrection again (read it when I first heard of it years ago) and I am seriously thinking of having it done. Why? Simply because I want to look as human as possible even in the early morning! Yes, I look like an alien without my brows. Seriously, a friend of mine called me that when we had a sleep over and saw me without my fabulous drawn brows. She's no longer my friend, just in case you want to know. Wahahha, kiddin! 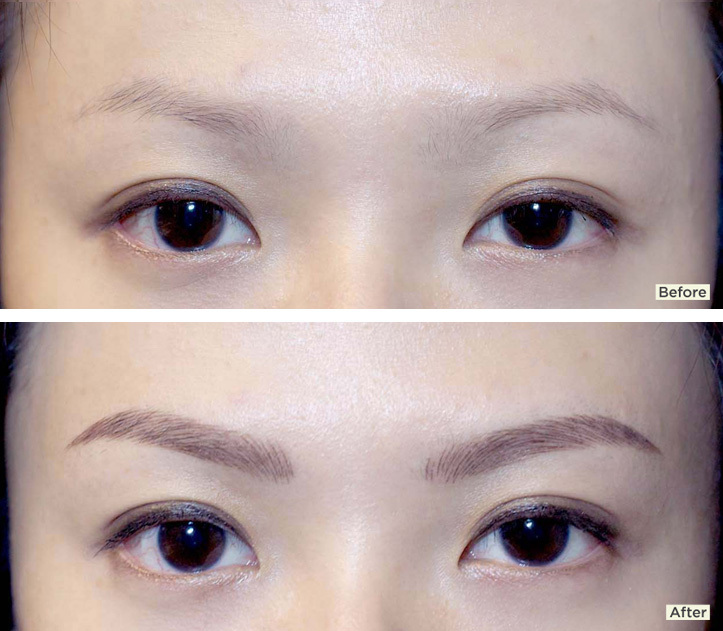 Unlike the usual tattoo, this procedure uses vegetable dye and the strokes to draw the brows are more detailed and natural, making them look like real hairs. With the proper after-care, the brows can last up to two years. It will fade, yes, but at least all I need is a bit of filling in and it'll be all good. I read they have two types, the Natural and Define. I'm thinking of getting the latter just because it lasts longer. I am scared to get a tattoo but I think I'm ready to let go of my fears in exchange of beautifully-drawn brows any time of the day! There's a clinic somewhere here in Dubai that offers the same thing, but I haven't read any testimonials from a fellow Pinoy. And honestly, I would prefer if they have a kabayan eyebrow specialist too. I am being a racist here, it's just that I'd feel a bit more comfortable if I have a fellow Pinoy to whom I can talk to, ask questions and well, have a bit of kwentuhan while undergoing the procedure. I'm keeping my fingers crossed that I can go home end of this year, so I can have a consultation at Brow Haus. I've talked to Trixie via IG and she had it done pala. No wonder her eyebrows look always on-point and fabulous! Now the problem is, the tune-up a month or three months after the treatment. I don't think I'd be able to fly back for that. But maybe, if I'd be able to have it done days after I get home, a tune-up can be done before my 3-week vacation is over. Hmm, or maybe if they won't consider my brows that problematic, maybe a tune-up won't be really needed? Wachutink? Hahaha! Please bear with me, just the thought of having brows without having to spend a good 10 minutes working on them really excites me. I remember considering the eyebag removal procedure years ago. I actually had it almost done but the problem was the down time. I was told I need to take a break from using the computer for a week or more, but in my line of work, that is not acceptable. It's still on my bucket list, but under the less priority category. LoL! This procedure costs Php38000. Steep yes, but I think it's gonna be worth it. I still have a few more months to go so let's see if my mind won't change until then. But for now, it's a YES for me. And again, sorry for the lousy title! Same boat here... hate it when my eyebrows get oily and shiny :P I also considered this procedure by Browhaus but I think it's too pricey :P and I'm thinking what if I want to change the shape of my brows? I'd think about it in two ways, what if your opinion on your brow shape changes? What if you get it too thick or the wrong shape. Then the other side of the coin is it is kind of the opposite of waxing your brows, just a lot more expensive. What ever you decide be sure to post before and afters! I was also thinking of considering having my brows tattooed and I think I find the way to do it, thanks to you for sharing this. do they have a branch here in Dubai?